A good friend had her second baby today and I got to go visit her in the hospital. I’m working on a very special gift for the baby, but it’s not finished yet and I couldn’t just show up empty handed! Ellen (the mom) had mentioned that she wanted a new blanket for the baby, as the first baby is sort of possessive of all the existing blankets. Well, I just happened to have a pieced blanket backed with chenille that I made a few months ago and never really finished. Inspired by both Heidi and Amy, I decided to tie the quilt. This worked out great with the chenille backing, as trying to quilt it with my machine proved disastrous. I used DMC floss and tied a little tie at the corner of each “square” of fabric. I was very pleased with the results and hope the litle baby is too. 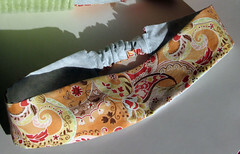 I made this matching headband for Ellen with some leftover fabric I had. I wanted to give Ellen something because the mommy often gets ignored in favor of all that baby cuteness. I figured a headband is something that a woman who had just delivered a baby could probably use. I know, that I sure could have used one when I was in the hospital after having Simon. He was delivered by C-section and I threw up while I was on the operating table – right into my hair. My husband did the best he could to clean up my hair, but I never did get a chance to wash it until three days later when I came home. A headband wouldn’t have helped the grossness, but it would have disguised the badness of the hair and made it look better for pictures. Or, at the very least, it would have drawn attention away from my hair and towards the pretty headband. 4 Responses to New Baby! I love the patterned fabric, and the headband is cute as well. Great job! I’m sure she’ll love both gifts. I think giving baby gifts is one of my most favourite things to do in the world. Your baby quilt and matching Mom head band are really fresh and pretty! 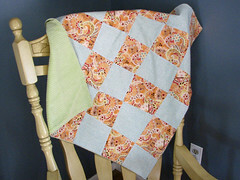 I’m sure the baby will be very happy to have her own little quilt! 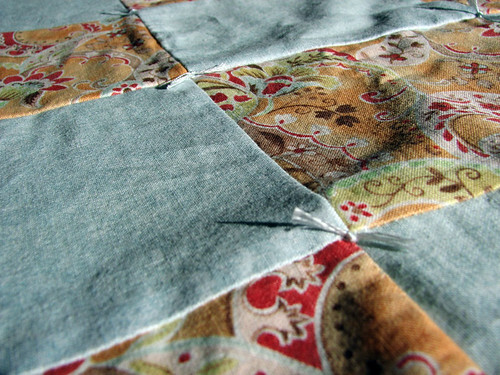 I’m humbled that you were inspired by me to tie the quilt – what did you think of it? I think it adds a fun dimension to the quilt. Kate–don’t think about this until after Christmas–but if you can get more of this fabric, I’d love to order a diaper bag or purse to rock out the mommy/baby coordination. Tim also loves the giftsas well, and so far, little’Lizabeth has not been wrapped up in another blanket yet!